Your Temple, Lord - from concerto for soprano and mixed choir "Elegy"
Habanera - from concerto for mixed choir "Poetry of Igor Severyanin"
Autumn - from concerto for mixed choir "Stanzas by Pushkin"
This new release from the Latvian Radio Choir conducted by Sigvards Kłava features timeless choral works by three composers from Russia and Latvia: Yuri Falik, Arturs Maskats and Georgy Sviridov. The themes of the 20th and 21st century choral works presented on the disc range from love to nature and the sacred. Five of the works include solo parts which are sung by two notable Latvian singers, Aleksandrs Antoņenko and Eva Ezeriete. Latvian Radio Choir's previous releases on Ondine have been highly successful. For instance, the recording of Rachmaninov's All-Night Vigil (ODE 1206-5) was chosen as the Record of the Month, Editor's Choice and received a nomination in the Gramophone Awards in 2013. 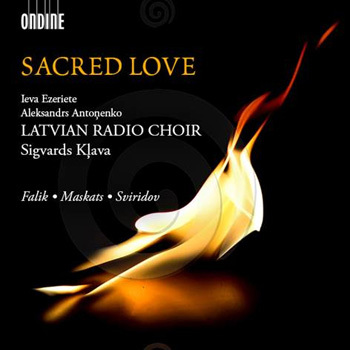 The title work of the recording, Sviridov's Sacred Love, is a unique example in its spellbinding beauty of aesthetic and soaring vocal writing. The Latvian Radio Choir is regarded as one of the top professional chamber choirs in Europe. The repertoire extends from the Renaissance to the present day. The Choir regularly commissions works from leading Latvian composers. Sigvards Kļava, Chief Conductor and Artistic Director of the Latvian Radio Choir since 1992, is one of Latvia's most prolific choral conductors. Apart of the standard repertoire he has conducted most premières of new choral works by Latvian composers.